Welcome to Part II of our in-depth look into the details that add value to a vintage Explorer II ref. 1655. If you haven’t already, make sure to read Part I. The Rolex Explorer II 1655 has a few unique features that are fascinating. What’s A Frog Foot Coronet on the Vintage Explorer II 1655? While the Mark II dial of the Explorer II ref. 1655 no longer has the straight seconds hand, it has another desirable detail—the “Frog Foot” Rolex crown at 12 o’clock. As its nickname suggests, the famous Rolex coronet resembles the foot of a frog thanks to the thinner-than-usual stems and slighter fatter round end points. The Mark II Frog Foot dials were manufactured from about 1972 until 1978. This detail commands high prices in the vintage market. You can see the details of the Rolex Explorer 1655 which make it stand out. 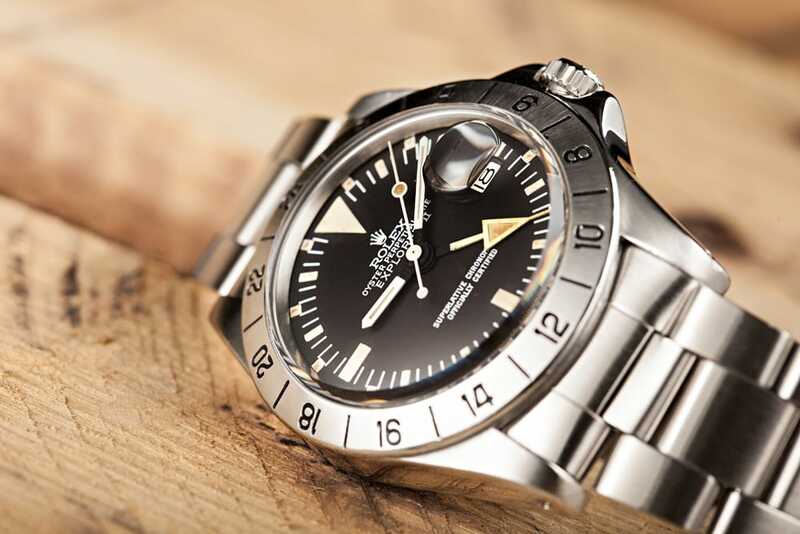 What’s an Explorer II 1655 Rail Dial? When speaking about vintage Rolex watches, a “Rail Dial” refers to when the letter “C” in “Chronometer” aligns perfectly with the letter “C” in “Certified” in the SUPERLATIVE CHRONOMETER OFFICIALLY CERTIFIED text on the dial. This is the case on the Mark III version of the Explorer II ref. 1655. Again, this is a coveted detail, therefore adds to the value of the timepiece. As Rolex modified the luminescent material on the dial, the label under 6 o’clock changed accordingly. Mark I, II, and III dials all include the T SWISS T label, indicating the presence of (radioactive) tritium on the dial for luminescence. Following that, Mark IV, V, and VI dials featured the T SWISS <25 T, signifying tritium that releases less than 25 mC—i.e. slightly less radioactive. Finally, dials with just SWISS do not have tritium but rather Luminova (non-radioactive) material. However, it’s important to note that these are service dials as Luminova only became available on Rolex watches in the late 1990s – much later than the production period of the Explorer II ref. 1655. While all vintage Explorer II ref. 1655 watches are collectible, a replacement dial does negatively affect the value of the timepiece. 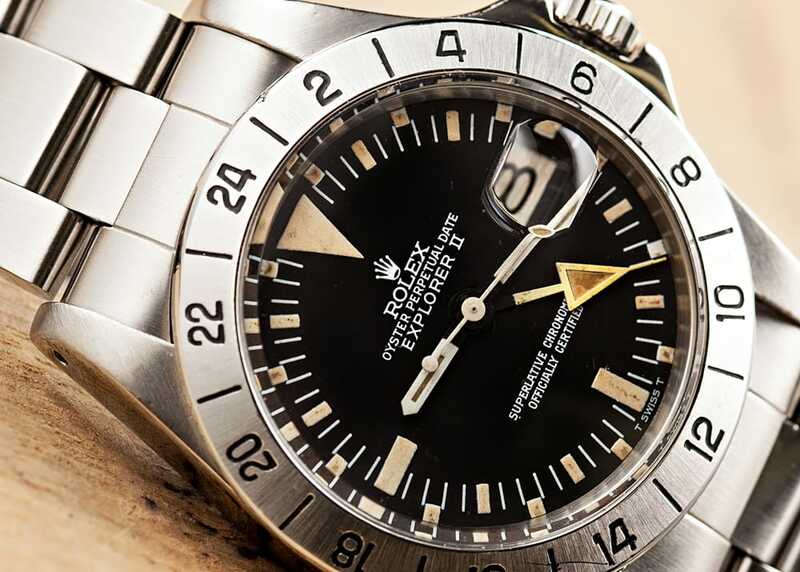 The Rolex Explorer II 1655 is without a doubt a stunning timepiece if you’re a vintage collector. As with most things, taking the time to properly examine and research the details on a particular vintage Rolex watch is imperative to comprehend its true value. Earlier versions of the Explorer II ref. 1655 (straight hand, frog foot coronet, or rail dial) tend to be more expensive than later ones, so it’s important to know what exactly you’re paying for—or selling for, if that’s the case. 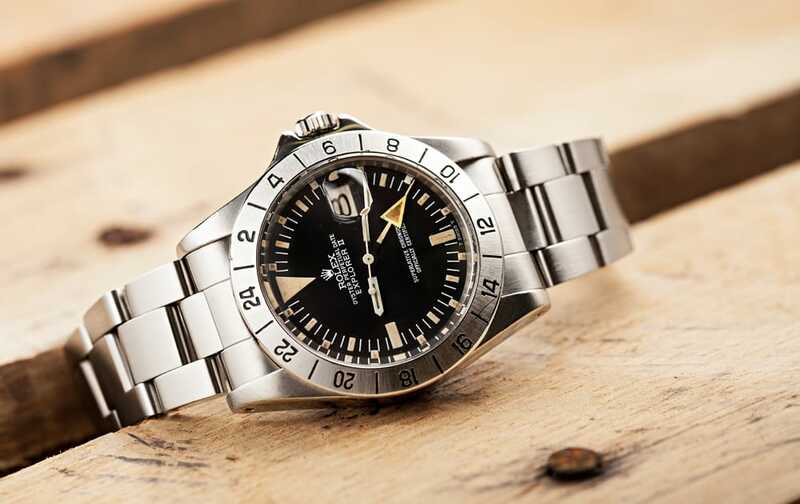 What are you thoughts on the Explorer II ref. 1655? Do you like the style? Share your thoughts with us in the comment section below! Stayed tuned for future articles where we will study other famous vintage Rolex models and the minute details that drastically alter their value.